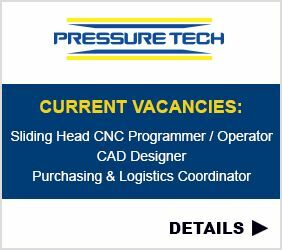 Pressure Tech - Quality Pressure Regulator Manufacturers - WE HAVE EXCITING NEW VACANCIES! We Have Exciting New Vacancies! Are you an experienced Sliding Head CNC programmer / operator? Do you have a background in CAD design? Are you a savvy purchasing and logistics coordinator? We would love to hear from you! MORE DETAILS.